Earn 324 loyalty points, worth £16.20, with this purchase. Rambo Turnouts are made form Super Strong Ballistic Nylon - the stuff they make bullet-proof vests from; you can’t get much tougher than that. Ballistic Nylon is substantially stronger and more durable than most other fabrics. On close inspection, a Rambo Turnout can withstand many years of use and wear. • Chest Trigger Clips have been fixed on an inward angle to strengthen them and ensure they are fastened correctlytowards the horses’ chest. • PVC Coated Tail cord replaces the usual Fillet strap. This makes it easier to clean. • Stainless Steel hardware prevents rusting and is incredibly strong and hardwearing. • Quick Release surcingle straps will free should your horse become dangerously caught in his surcingle straps to help prevent injury. This also will help prevent any damage to the rug. • Anti-bacterial lining eliminates bacteria, which multiply inthe presence of dirt, moisture and heat, which can cause infections and allergies. 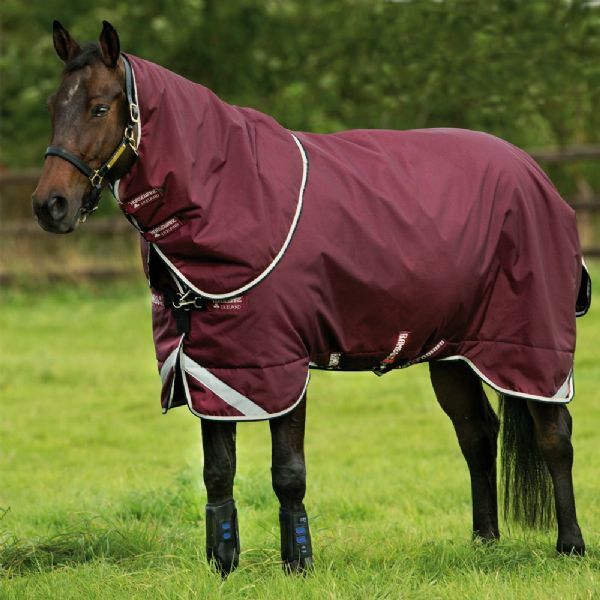 The hydrophilic nature of the lining will conduct moisture away from the horses’ body where it will then be absorbed by Horseware’s unique AquaTrans™ coating.